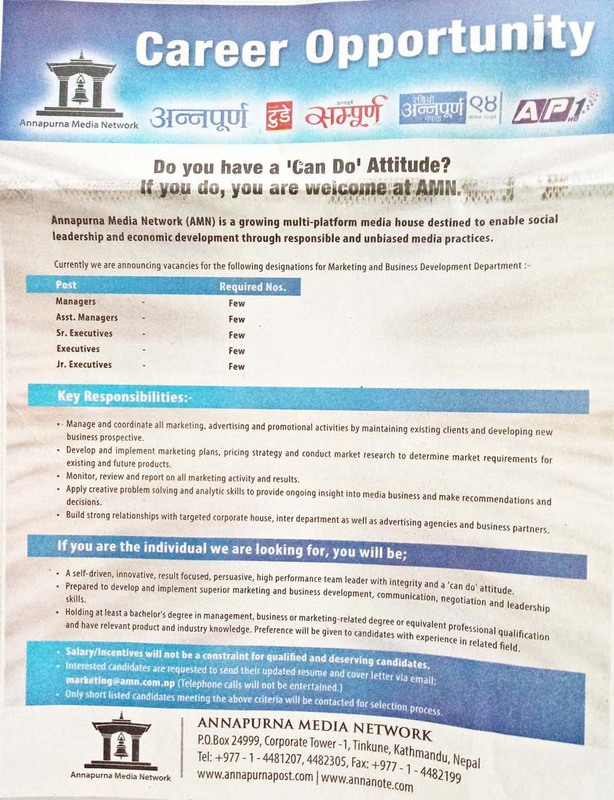 AMN has been seeking a growing, energetic, qualified and ‘Can DO’ attitude manpower for its growing multi-platform media business house in Nepal. Annapurna Media Network Vacancy seeks to attract the attention of the qualified few Managers, Asst. Managers, Sr. Executives, Executives and Jr. Executives jobs in Annapurna Media Network. Prepared to develop and implement superior marketing and business development, communication, negotiation and leadership skills. Has completed a bachelor’s degree in Management, business or marketing related degree or equivalent professional qualification and have relevant product and industry knowledge.